Projects I’ve been working on. 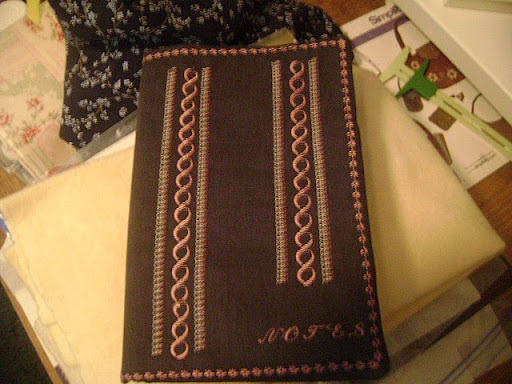 I used some of my machines heirloom and quilting stitches for the design. Not sure I like the design but didn’t want to waste fabric. The border is a eyelet stitch using the wing needle. 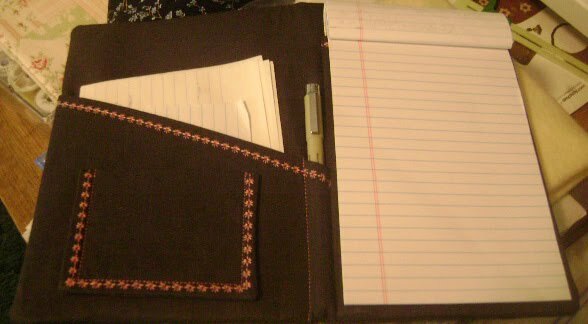 The inside is also done with eyelet stitches. My pen pocket is a little small but it works. 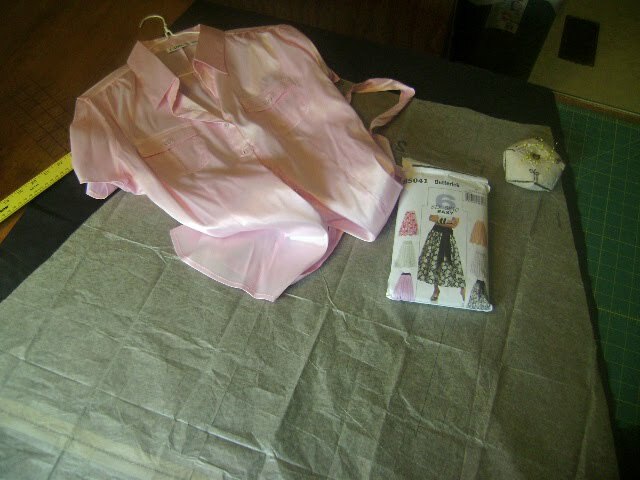 Below is a skirt that I was going to start and the shirt I wanted to wear with it. You can’t tell in the picture but the fabric is close to a charcoal grey and a little shine to it. I have finished the skirt and will post pics when I wear it. The only thing I didn’t like was that it has a front seam. 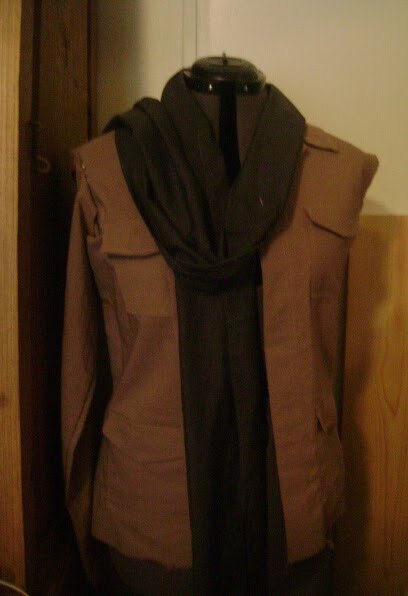 This is a jacket I started ages ago. Needless to say it is a UFO. The “scarf” is actually the belt to the skirt above. 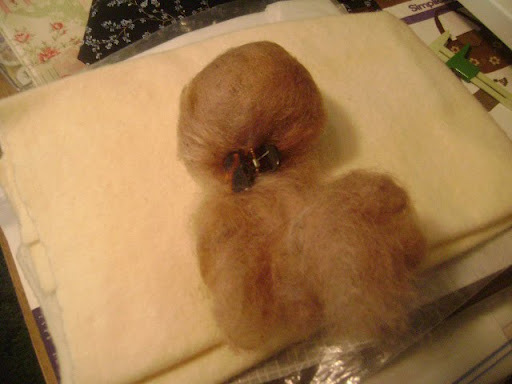 Last but not least is the start of an attempt to make a Waldorf Doll. We’ll see if it actually is accomplished. Hey Elaine! Miss you! I like the projects….I think the patchfolio looks really nice. And I'd like to see what the doll looks like too. Sydnee would love to start sewing, I need a good easy first time project for her. (probably not the doll though) How are you?? I heard you went skating, sounds like fun. We fly to HI in one week. Take care and I'll talk to you later. Hi, Laura! It's good to hear Sydnee is interested in sewing. How did your UFO's come? Did you finish the jacket or the doll? I gave sydnee an old wood doll crib and let her sew a big rectangle pillow to put in the bottom, then a small matching pillow. She enjoyed it and was proud of it but near the end of the project she had handed most of the sewing over to me. lol Thats just Sydnee, easily bored. I think that heritage place in Tx is somthing I would really like. We went to an old plantation in alexandria La and it was interresting, they told us all about bee raising and sold fresh honey! Well, take care!